Awarded 2017 Show of the Year and 2015 Entertainer of the Year by the Terry Awards, Clay Cooper has proven to be one INCREDIBLE entertainer. Don’t miss this high energy show filled with singing, dancing, trick-roping, comedy, and much more! Clay Cooper’s Country Express has something for everyone featuring 24 entertainers, great visual effects and a variety of music-old and new country, current hits, rock, gospel, and patriotic. This is one show you DON’T want to miss! Located on Hwy 76 across from The Titanic Museum. 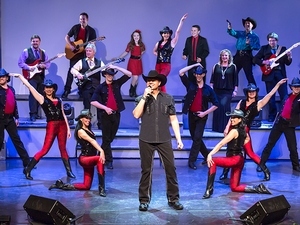 Clay Cooper has been performing for Branson audiences since the age of 16, originally coming to Branson to perform with a kid’s band known as the Texas Goldminors. Clay loved singing and playing bass, and loved meeting new people. What better place to do it than Branson! He continued performing in several Branson shows and now celebrates his 32nd season performing. Clay hangs out after every show, greeting the audience and meeting new fans! In November and December, Clay Cooper’s Country Express features an Ozark Mountain Christmas Celebration that has become a “MUST SEE” in Branson. The first half features highlights from our regular season show, and the second half is ALL Christmas! Clay-Goods JamborEVE: Celebrate New Year’s Eve with Clay Cooper’s Country Express and The Haygoods for a family-friendly, unforgettable, Blowout Party! Hors d’oeuvres and a cash bar will be available for those who might be interested. There will be party favors for everyone, and a MASSIVE balloon drop happens at the stroke of midnight! This year, Clay Cooper and his talented cast of 24 singers, dancers, and musicians will be joined by the Haygoods for a memorable NEW YEARS EVE experience!